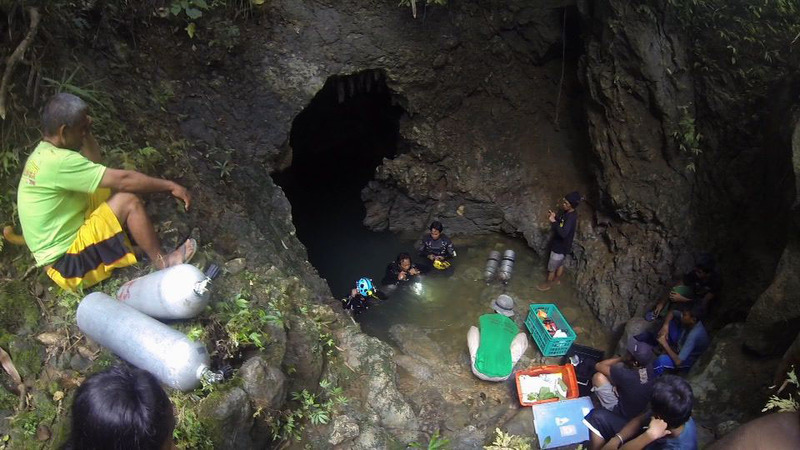 April 18, 2014 April 21, 2014 filipinocavedivers Cool Stuff! Fig 1. This twin cenotes is named after Bartolome “Toloi” Daclan, caver extraordinaire and natural naturalist of Siargao Island. Toloi is instrumental in FCD’s Del Carmen and surrounding areas discoveries. April 2, 2014, Day 2 of FCD’s Del Carmen Expedition I, is a milestone. 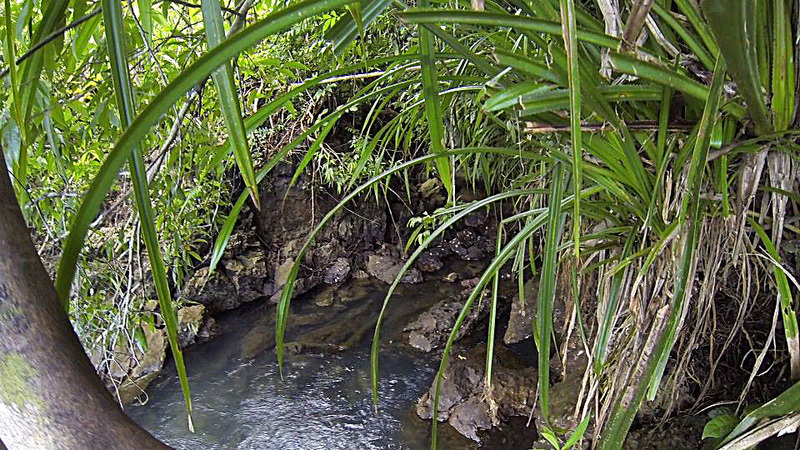 In the afternoon of this date, we discovered the first of many cenotes in the Del Carmen and surrounding areas. The Kantoloi Twin Cenotes, right off the concreted road that goes from Del Carmen to Pilar, the neighboring municipality, is a gem of a place in so many ways. 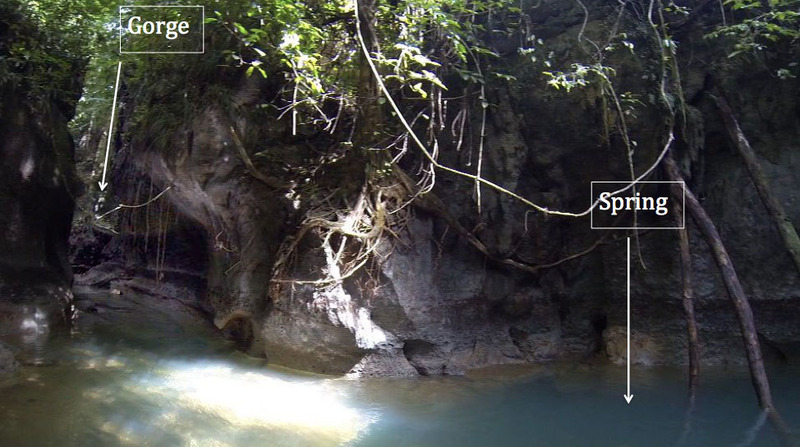 At entrance into the area, one is greeted by an awe-inspiring scene of a head spring that forms into a small river that appears to have carved a gorge out of the limestone, and disappears through twin entrances into a subterranean river (think Palawan Underground River). Fig 4. The underground river exits into the main river of Pilar more than 500 meters from the cenotes. The run from the spring out into the Pilar river on surface craft (inner tube, short kayak, etc) can be an ecotourism adventure. This will need to be explored further following thorough exploration of the underground river – of course with the blessings and guidance of Hon. Lucio Gonzales, Mayor of Pilar. The underwater cave diving potential of Kantoloi Twin Cenotes is enormously promising as well. There are 2 entrances in the area, possibly leading to 2 different cavities although physically right next to each other. The sump entrance was an eye-opening pleasant surprise to the team when the first foray did 73 meters of penetration. This was pushed a day later to 120 meters. The head spring of the small river leading to the gorge surprisingly revealed a 1.5 x 1.5 meter entrance leading to a cavity that seems to divert away from the sump cavity next door (Fig 2 above). This lone dive was only a solo, limited penetration look-see. The substrate at the entrance and on to the cavity was hard limestone rock formations, a bit of a contrast to the sump side next door. More dives need to be done to develop Kantoloi Twin Cenotes into a cave diving destination. No doubt after further pushes, compass bearing determinations and photographic documentation the “Twins” will end up a popular destination. This will be on the top list of FCD’s Siargao Expedition II tentatively scheduled to run between the second week of June to the second week of July. Acknowledgement: All photos were ripped from Lyndon Cubillan’s videos. That is true. As an example, the Maya used human sacrifices to appease the Maya rain god, Chaak. The bodies were then thrown into the water-filled sinkholes they called cenotes. The sinkholes “represented thresholds of communication with the spiritual and sacred world that lay under the surface of the Earth,” says Guillermo Anda, a professor at the Autonomous University of Yucatán. A fine article about the Maya and their rituals can be read at the National Geographic website.